In 30 years of sales and marketing I’ve dealt with a lot of CRM (Customer Relationship Management) systems. I’m tired. I’m tired of the countless tutorials, the “how do I create a report for my client” questions, the obscure field names, the badly written documentation, and the cumbersome procedures. 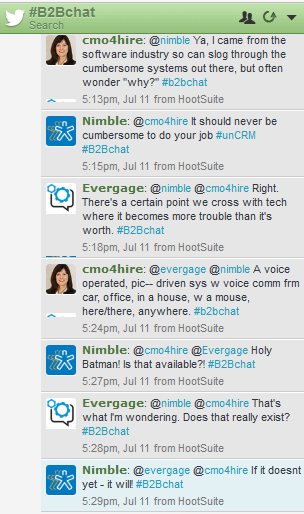 After working on one such system yesterday (I will name no names), I popped onto one of my favorite Twitter chats – #B2Bchat. As I looked up the bio of one of the participants, @Nimble, I complimented them on their profile on Twitter. “We’re the #unCRM. Our Smart Relationship Manager helps you turn your contacts into customers for life. Engagement. Insights. Nimble. #socialselling #socialbiz.” And I dreamed out loud – that there must be a photo oriented, drag and drop, voice activated CRM system. That’s right, a CRM system where you leave the prospect site or phone call, pop open an app on your mobile device, select the photo of the person, drag and drop the next step in the buying cycle or your next event into a calendar. An automated voicemail or onscreen survey asks you relevant questions about the call and auto fills in your answers and records the time of the meeting or call. Integrated social media showing you all in one place the convos your prospect is having with you and others. Is it out there? 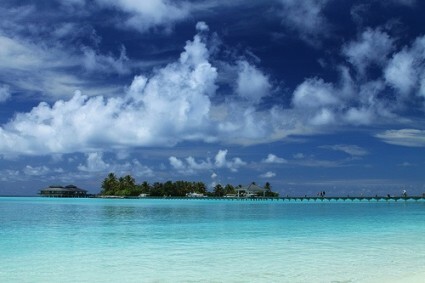 Call it blue sky or blue ocean (could this be a Blue Ocean Strategy? ), some of us are ready. It’s about time! Do you know of such an automated, easy-to-use CRM system? Please tell us about it below. You know when sometimes you read something and it just ‘hits a nerve’ that’s exactly what your piece did. We have a real push this year for our next version (nothings sure in life, but, there is always a next version) to deliver this convergent approach. In the same way that we have seen convergent telecoms over the last decade, I think we are just starting to see ‘true’ convergence in the CRM market place. Not wanting to just plug what’s coming, but keep an eye on opencrm.co.uk for some Blue Ocean thinking over the coming year. Thanks, Graham, this sounds promising. I’ll stay tuned…. Next post: B2B Marketers: Do Customers Have a Tattoo of Your Brand?